While the rest of London was letting off fireworks to celebrate Guy Fawkes Night (Monday 5 November) there was a different form of illuminated, elemental drama unfolding in the house of Catherine Petitgas, the collector, patron and chair of the London art space Gasworks. She was hosting the much-loved Vauxhall-based organisation’s annual fundraising dinner, the highlight of which was an unforgettable performance by the Gasworks studio artist Victoria Sin. As the lights went down, the works by the likes of Beatriz Milhazes, Gabriel Orozco and Jorge Pardo covering the walls of Ms Petitgas’s art-lined sitting room were engulfed in a limpid projection of rippling water that provided the backdrop for Sin’s decidedly fluid (in all senses) work A View from Elsewhere (Part 1). 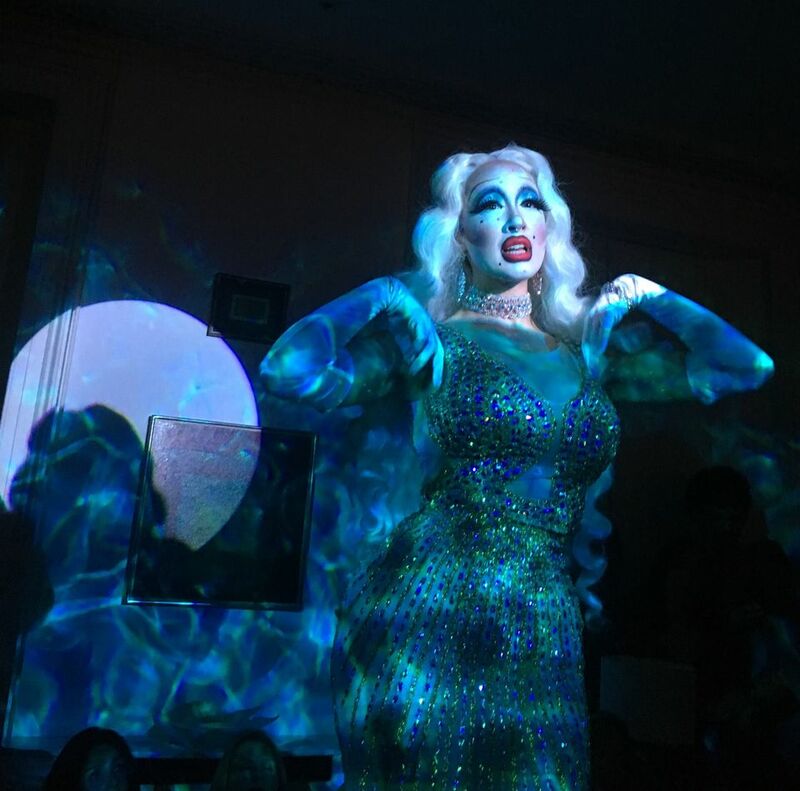 This involved the artist—who identifies as non-binary, uses the pronoun “they” and describes themself as “a non-male drag queen”—lip-synching a visceral, high-octane monologue that spanned pathologies of consumption, queer behaviour and evolution theory, whilst resplendent in a costume of body-hugging blue sequins topped off with a cascade of platinum blonde curls. Toronto-born but London based since 2009, Sin is one of 13 artists currently benefiting from studio space at Gasworks’s Vauxhall headquarters. For over 20 years, since 1994, Gasworks has provided not only a place to work but also international residencies and essential early exhibitions to a multitude of artists from the UK and worldwide, with its alumni including Chris Ofili, Yinka Shonibare, Marvin Gaye Chetwind, and Tania Brughera—who is currently occupying Tate Modern’s Turbine Hall. As well as Sin, Gasworks’s current intake of international artist occupants hail from New Zealand, Peru, Pakistan and Chile and after last night’s event considerable pledges were made and renewed in order to allow the invaluable work to continue.